Little Ida is a poor little girl who lives with her old grandma at the edge of a remote town. She can’t walk because her legs were badly injured when she was young. To support the family, her grandma raises a large garden full of flowers in the yard, and sells flower to the village people. So every day after the grandma leaves, the little Ida stays at home and waters flowers in the garden, talks to them and sings to them. One day, Ida finds the flowers look almost dead, that they all hang their head and lose energy. She wonders why, so she turns to her grandma’s pet cat, an old cat which magically can say human words, but only Ida understands it. The cat tells Ida that at the full-moon night, the flowers all go to the fairy ball at the center of the town at night, that’s why they look tired during the day. 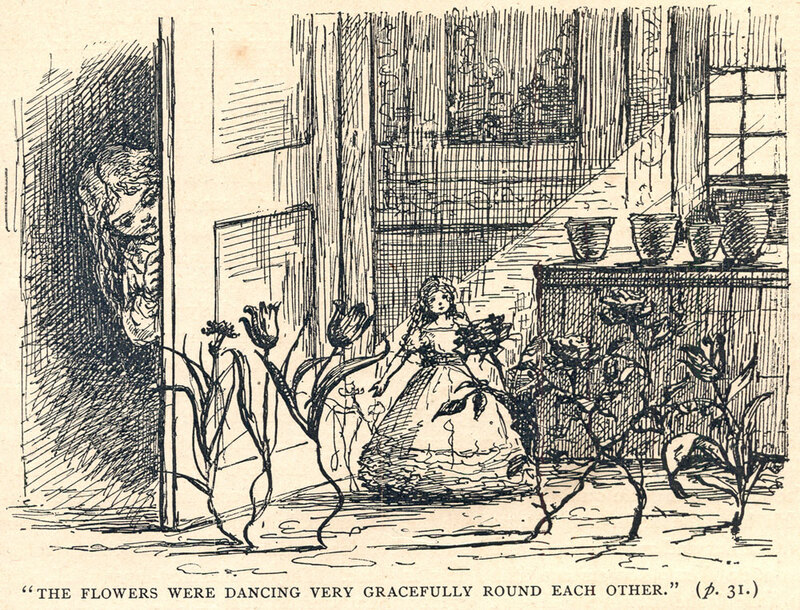 Then, the next evening with full moon, Ida stays up late and see the magic moment of flowers dressing up beautifully and leaving for the ball. She tries to talk to the fairy flowers, and all the flowers are shocked because their secret can’t be discovered by a human child. However, since Ida is a kind girl, they just ask her to keep the secret. As time passes by, one late night, the old grandma is badly ill, Ida feels helpless and she cries so badly for help, but no one comes. She cries and cries, and her tears nourish the flowers and turn them into fairies. They are moved by Ida’s kindness and sadness and agree to take her and her grandma to the doctor. So on the way of the country road, Ida is surrounded by the waves of flowers, she seats on them, like a queen of fairies. This is the first time she seees the outside world and she feels extraordinarily happy. They reach the doctor’s place and cure Ida’s grandma and also Ida’s legs. She feels so thankful for them but later on, the flowers tell Ida that their spirits have to leave because their secret is revealed. They will go back to the fairy kingdom. But if she bury their body in the garden, near to the grave of the canary; then, in the summer they shall wake up and be more beautiful than ever. After her grandma wakes up, Ida tells her about the poor flowers which were dead; and as soon as she obtains permission, she goes with her grandma to bury them. Ida kisses her flowers and then lays them with the box in the earth. She learns to become a doctor and help people in the town. And she prays in the garden every day until the next full moon night of summer comes. Ida is a kind and innocent girl who loves nature. One day she finds that her flowers in the garden are all dead. She feels sad and doesn’t know what has happened. Her friend, a student, comes and tells her that the flowers all came to the ball at the King’s palace at night. And that’s why they look so tired and almost like dead in the daytime. Ida turns excited and interested. She talks with the student about the details of the ball and flowers. The student explains to her that the flowers have their own way of talking, walking, and dancing. They decide to stay up at night to witness the magical moment. Then, the student’s professor who is also Ida’s grandfather comes and hears their discussion. He thinks it is nonsense and he doesn’t believe it. The student tries to persuade the professor, and Ida also tries to keep the professor with them. Finally, the professor cannot reject his cute granddaughter, so he has to stay with them, just for one night. They wait and wait until the night comes. Ida, the student, and professor hide behind the door, and then unbelievable things happen: the flowers gradually turn their heads up and transform into the humanoid statue. They are actually fairies! They are like ballet dancers, beautiful and elegant. Ida and student feel so happy, and the professor is also shocked but now he believes it. The flowers find them and invite them to dance. They dance happily together, and the children and flowers become really good friends.